Abdul Taleb (left) outside his grocery store in Oakland's Fruitvale last week. Attorneys working to nix language from November ballot. Attorney working for the American Beverage Association are accusing supporters of Measure HH, Oakland's proposed soda tax, of lying to the public in order to garner support. Yesterday, the beverage corporation attorneys filed a lawsuit seeking to have specific language, which they call "patently false" and "grossly misleading" deleted from the text of the ballot measure. The soda company attorneys allege that several claims made by the tax's proponents in their rebuttal argument, which accompanies the ballot measure, are false and misleading. The rebuttal states that the soda tax will be paid by distributors, which are mostly big businesses, and that it "is not paid by your local grocer." The rebuttal argument also states that, "for small businesses there is an exemption" from the tax. 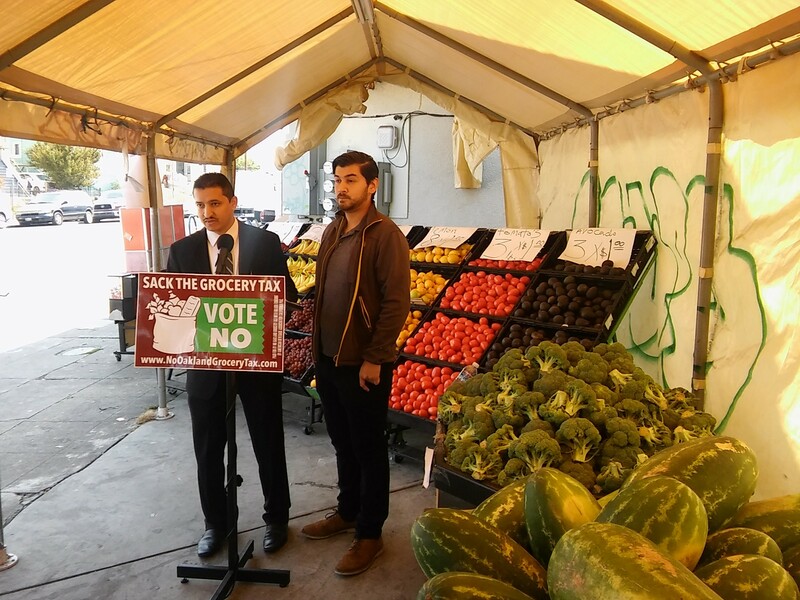 But according to attorneys from the Nielson Merksamer law firm who are representing the soda companies, some Oakland grocers will in fact have to pay the tax because they fit the definition of a distributor. "A local small grocer who purchases sugar-sweetened beverages at Costco in San Leandro or Richmond with the intention to resell these beverages at his or her store, and who 'transfer[s] possession' of those beverages to an employee to stock the shelves would thereby engage in a taxable distribution." In addition to fighting the Oakland soda tax in court, the Nielson Merksamer law firm is managing the soda companies' No On HH political action committee. Funding for the soda company's No On HH PAC has come from just five beverage industry giants: Coca-Cola, Pepsico, Dr. Pepper, Red Bull, and Sunny Delight. But officially, the soda companies aren't the one's bringing the lawsuit against Oakland election officials to have the text deleted. Instead, the petitioner is Isabella Coffey, identified as an Oakland resident and registered voter. The soda company attorneys are also arguing that the term "small business" is misleadingly applied in the rebuttal. According to the lawsuit, Measure HH defines a small business as one with under $100,000 in annual gross receipts. They cite federal regulations which instead define small grocers as having receipts of up to $32.5 million. If the soda attorneys win in court, the Oakland City Clerk would be barred from printing the contested text as part of the rebuttal against the No On HH campaign that will appear in the November voter pamphlet. The lawsuit is just the latest accusation of misleading tactics in the battle between the soda companies and supporters of the tax. But previously it was the tax's proponents, including doctors, dentists, and public health officials, who accused the soda industry of lying. In July, Oakland councilmembers Annie Campbell Washington, Desley Brooks, and Rebecca Kaplan said they planned to file complaints with the Federal Elections Commission and the Oakland Public Ethics Commission over ads paid for by the soda companies that called the tax a "grocery tax." The councilmembers said the "grocery tax" label is simply designed to scare voters, and that there's no evidence the tax will be passed on to items other than soda. The soda companies seem unfazed by the councilmembers' threat. Ads painting the soda tax as a tax on groceries continue to fill the mailboxes of Oakland voters. In fact, the soda industry's attorneys, and the petitioner Isabella Coffey, double down on the "grocery tax" message in their lawsuit: "...recent experience with a similar measure in Berkeley shows that the passage of such a tax ultimately leads to price increases on a wide array of grocery items at grocery stores and restaurants ... Because it is politically unpopular to raise the cost of groceries, supporters of Measure HH have sought to minimize and obscure the extent of this effect."